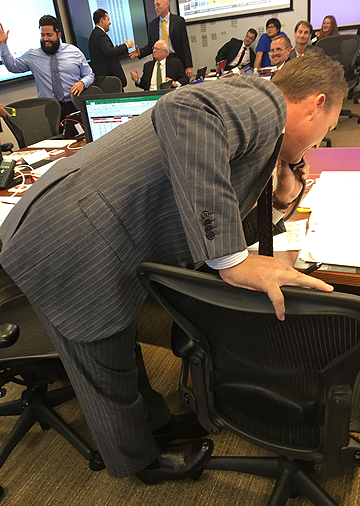 SANTA CLARA, Calif. — “Let’s duck in here a minute and talk,” rookie San Francisco 49ers GM John Lynch said to coach Kyle Shanahan and chief strategy officer Paraag Marathe in the team’s John McVay Draft Room here, motioning to his office across the hall 23 minutes before the start of the 2017 NFL draft. Three men, one plan. As they walked into the room and Lynch shut his door, this is what they knew: Cleveland, picking first, was not trading, and was likely but not certain to take pass-rusher Myles Garrett over quarterback Mitchell Trubisky … San Francisco, picking second, had three men clearly atop its board: Garrett one, Stanford defensive lineman Solomon Thomas two and, in a surprise, Alabama middle linebacker Reuben Foster three … Chicago, picking third, badly wanted someone. The Bears and Niners had an understanding that if Chicago’s man was still on the board after Cleveland picked (Chicago GM Ryan Pace wouldn’t tell Lynch who Player X was; the Niners figured it was Thomas), the Bears would give at least two third-round picks to move from three to two. No nerves, but no pleasantries either. Marathe, who talks very fast and with great confidence, called another team with interest in the second slot and said, “We got some good action on the pick.” Marathe talked to the club official (he would not disclose the official, or the team) for maybe a minute, just to crystallize that if Garrett was there at two, the Niners would either pick or take a ransom for the pick. “See if we can get one last thing with Chicago,” Lynch said to Marathe. It was the first draft for 49ers head coach Kyle Shanahan (left) and GM John Lynch. The Bears agreed. They’d give two third-round picks and a fourth-rounder to move up one spot. “Then why’d they go get [free-agent quarterback Mike] Glennon?” Lynch said. They debated, and made sure that if they couldn’t find a trading partner to move down from three, they were comfortable taking Foster—with a questionable shoulder and a positive combine test for a diluted drug sample—with the third overall pick, if the Bears took Solomon. But they wanted to try to move down as far as No. 8 because they felt Foster had no chance of being selected before Cincinnati at No. 9. Four minutes passed. “Don’t lose Chicago, Paraag,” Lynch said. Eight minutes until the draft went live in Philadelphia. The Niners were fairly sure Garrett would go number one. Now they’d made a verbal deal with Pace for the number two pick. They felt good. They felt mystified. They weren’t sure who the second pick would be. They weren’t sure if they’d be able to deal the third pick down for more picks to replenish one of the least talented rosters in the NFL. After four months of studying a vital draft, the GM and coach who’d been paid millions with twin (and unheard of) six-year contracts truly didn’t know if they’d have Thomas, or Foster, or a bevy of draft picks and neither, or a bevy of draft picks and one or both, by the end of the evening. Lynch took over as GM in late January with no previous experience in an NFL front office. In the 24/7/365 media crushing of the NFL, somehow the significance of this San Francisco draft was, if anything, being underplayed last week. Think of the historic similarities to the only great era in Niners history. In the spring of 1979, the 49ers were coming off a 2-14 season, with a new coach/GM, without a quarterback of the future, and with a 30-something owner. Entering the draft last week, the 49ers were coming off a 2-14 season, with a new coach and GM, without a quarterback of the future, and with a 30-something owner. When I pitched the inside story about the new 49ers regime’s first draft to Lynch at the NFL owners meetings in March, I explained the similarities between Bill Walsh’s start 38 years ago and the new start now. “You just gave me goose bumps,” Lynch said. And so this story was born. There was one major difference. In 1979, the Niners were a year removed from making one of the worst trades in NFL history: acquiring a broken-down O.J. Simpson from Buffalo for five draft choices, including the first overall pick in the 1979 draft. Simpson had 108 rushing yards in his first Niners home game, and never had another impactful game in his last 21 for San Francisco. But that trade actually was to the Niners’ advantage, as it turned out. When Eddie DeBartolo cleaned house after the ’78 season, he hired Bill Walsh as coach and architect—and the lack of a number one pick forced Walsh to dig deep to find his quarterback. He got Joe Montana at the end of the third round. In the next two decades, the 49ers won five Super Bowls. It left much for the new Niners to live up to. That’s part of the reason why Lynch woke up at 3:30 a.m. on draft morning. His mentor and friend John Elway had told Lynch to pace himself—that nothing of importance happens on draft morning or afternoon. Lynch told his scouts to come in at 1 p.m. PT, with the draft scheduled to begin at 5:10 p.m. But Lynch was a kid on Christmas dying to open the new Xbox under the tree. He got up and watched tape of some second-round prospects in his hotel room two miles from his office next to Levi’s Stadium. He did a workout, then jogged to his office. While he ran, he sought a break. Before Lynch went to bed the previous night, Elway called to alert him that he’d heard reliably that the Browns really might take Trubisky, not Garrett. Someone else told Lynch on Wednesday night that Cleveland coaches would be stunned if the pick was anyone but Garrett. Whom to believe? Wisconsin pass-rusher T.J. Watt was of particular interest, though there was a good chance he’d be gone by the end of round one. They watched Watt slice and dice through offensive lines. Lynch loved him. It was clear he could be a candidate through a trade late in round one, or at 34. 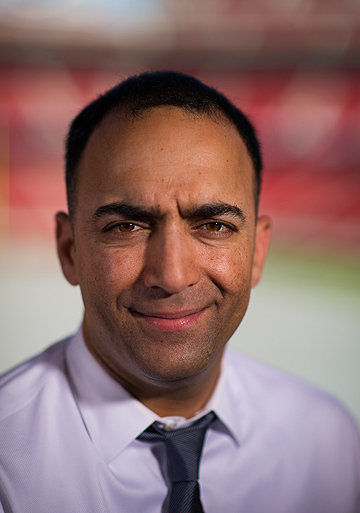 Paraag Marathe, currently the vice president of football operations, has worked for the 49ers for 17 seasons. But the talk kept coming back to Foster, if indeed he would be the pick at number three. Marathe was talking theoretically to his agent about some contract concessions to address Foster’s off-field concerns, and the agent was amenable. The 49ers were going to be comfortable picking Foster third overall if they couldn’t move, even though they knew they’d be subject to criticism for taking him too early if it happened. “He's not getting past Cincy [with the ninth pick in the first round], though,” Lynch said. Really interesting part of the pre-draft hours that would surprise most people: These guys have the second pick in the draft. They’re in the belly of the beast. And they truly don’t know what’s going to happen. 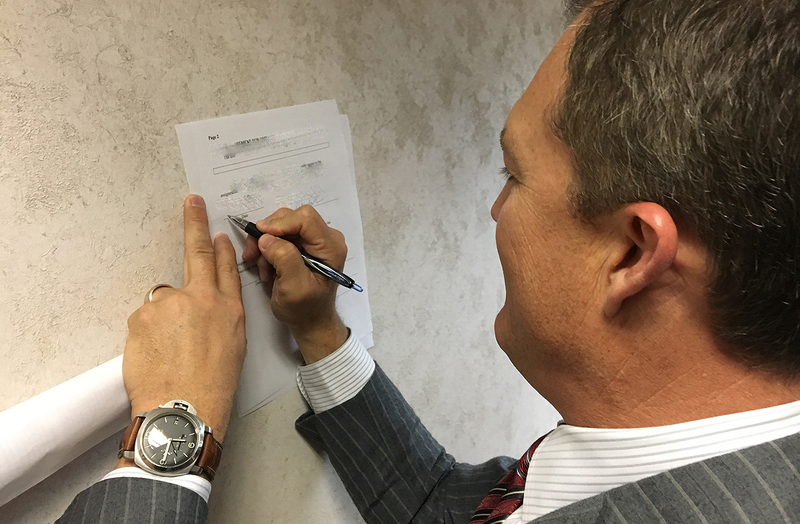 Lynch signs the trade agreement that sends the No. 2 pick to the Chicago Bears. The draft began. Garrett to the Browns. The trade with the Bears went through. No drama in the draft room. The TV seemed happier. “The 49ers picked up all that draft capital—phenomenal!” Mike Mayock said on NFL Network. Then the waiting, and Marathe made a round of phone calls between four and 14. Six teams said no. No trade-down. With the No. 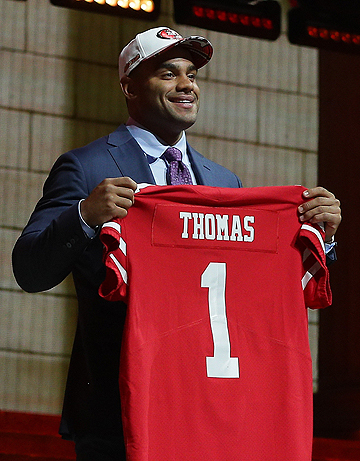 3 pick, San Francisco selected Solomon Thomas, who played collegiately at nearby Stanford. ​Shanahan got on the phone next. “I told you it’d all work out,” Shanahan said. Foster still there. Miami, 22, standing pat. Giants, 23, keeping. Raiders, 24, staying. Seattle GM John Schneider (26) called. Schneider would think about it. No deal. A few more calls. Some confusion with Schneider about the trade chart. Schneider traded down from 26 to 29, and then from 29 to 31. Reuben Foster was an option for the 49ers at No. 3. They ended up taking the Alabama linebacker 31st overall. The room could feel it. A gift from the gods. Whether they’re worried about his shoulder or his smoking or his lifestyle, Reuben Foster, the third player on the board, the player Shanahan called “my favorite player in this draft,” sits there. 8:24 PT. No call back. “I don’t think it’s happening,” Marathe announced. 8:25 PT. Lynch called Schneider, who said he’s thinking about it. No reason not to do it, according to the draft trade chart most teams use. Each pick in the draft is assigned a value. You total the picks on either side of the trade, and if they’re close to equal, the deal is usually agreed on both sides to be fair. This had to work. The 31st pick has a value of 600 points. San Francisco’s two picks—34 and 111—totaled 632. The room was buzzing, and excited. Getting louder. “GOT HIM!” someone yelled. Lynch picked up the phone, and one of all-time weirdest conversations in draft history happened next. 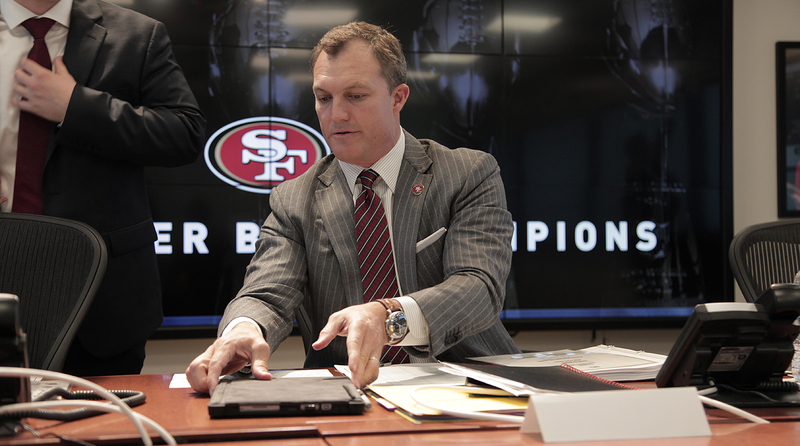 Lynch congratulates Foster on the phone while the 49ers draft room celebrates the pick. “HOW ’BOUT THAT S---!” someone screamed. Fans hugged in the back of the room. Eighty-three bro hugs in the front of the room. Shrieks. Lynch on the phone, trying to be heard by Foster. “I was like, okay, I gave her the phone. You know, you don't want to argue with no head coach. You respect them! So I gave her the phone and I was just nervous and scared just thinking about what they were talking about. But all he was saying was, Is she gonna be that guidance and that person and make sure I don't get in no trouble. This I heard after the fact. “So my girlfriend holds the phone out to me. Call waiting. I look at the screen. San Jose California. 408 number. Lynch finally got through to him, and explained it exactly, and the excitement in the room didn’t die down for the two minutes it took for Foster to understand he was a 49er. “It’s the pick we had no business getting!” Jed York said, 20 minutes later. On TV, Mayock said: “This kid’s got tape like Kuechly.” On TV, someone else worried about how long Foster’s surgically repaired shoulder would hold out. Earlier, the Niners said their doctors passed Foster and thought his shoulder was okay. “What shoulder!” Ferguson yelled back. Having a cocktail 90 minutes later, Marathe still looked shaken. And thrilled. One round in a seven-round draft was over. Would anyone here have the energy for the remaining six? 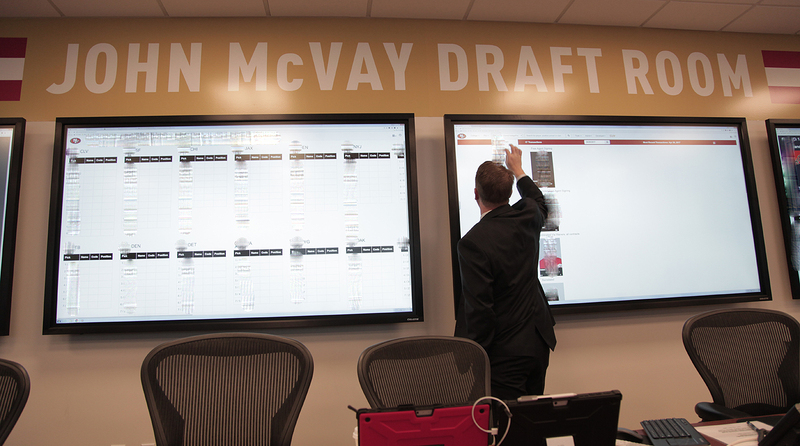 The 49ers draft room is named for John McVay, who worked in the front office for all five of San Francisco’s Super Bowl-winning seasons. Friday. Rounds two and three. Niners with the 66th and 67th overall picks, both early in the third round. Shanahan liked a bunch of players, including corner Ahkello Witherspoon from Colorado and Ohio defensive end Tarell Basham. But there was no second-round pick, and lots of action on the two third-round picks. The Saints badly wanted Tennessee running back Alvin Kamara, and Lynch wondered if the Saints would part with next year’s second-round pick and a low pick this year for number 67. Lynch called the Saints, got a six this year and two next year, and in his chair, Shanahan wasn’t pleased about missing out on a good player this year. But he understood. “We’re not one or two players away,” Shanahan said. “This is about building a program.” They chose Witherspoon, a versatile but not particularly physical corner whose best asset might be his height: 6'2¾". Three picks, three defensive players. 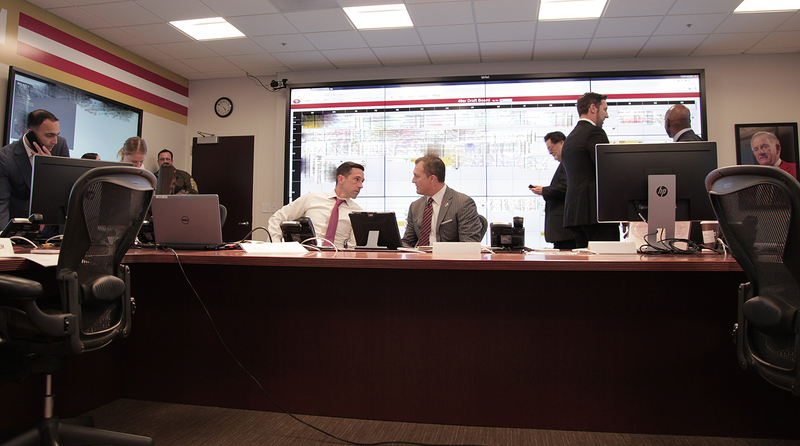 Back into the draft room, the team re-examined the wide HD draft board that covered the front wall. Basham went to the Colts at 80. There wasn’t a player they had to have, but they’d picked up an extra seventh-round pick in an earlier deal, and someone suggested moving from early in the fourth round to late in the third, five spots up, to snare the only quarterback Shanahan wanted in this draft: Iowa’s C.J. Beathard. “We’d all sleep a little better if we got him instead of waiting ’til tomorrow,” York said. C.J. 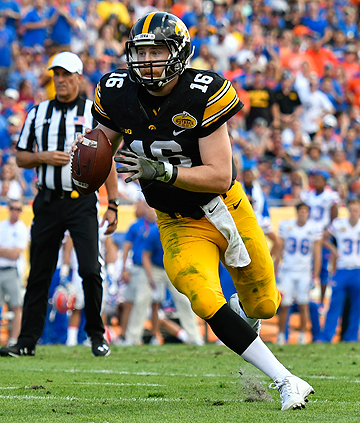 Beathard started at quarterback his final two seasons at Iowa and led the Hawkeyes to the Rose Bowl in 2015. Of course, there is an almost mythological quality to this trade. Think of it. In 1979, Bill Walsh, with only veteran journeyman Steve DeBerg to give him a chance to win that season, waited until the end of round three to take a lightly regarded Midwestern quarterback, Joe Montana. In 2017, John Lynch, with only veteran journeyman Brian Hoyer to give him a chance to win this season, waited until the end of round three to take a lightly regarded Midwestern quarterback, C.J. Beathard. Indeed. So now, with the evening over, there was a solitary figure staring at the draft board. It was a little like the stare of John Nash in A Beautiful Mind. Shanahan was trying to figure out, with both high fourth-round picks now traded, what he could do to get the one player he wanted above all others, now that the Niners would not be scheduled to choose until the 36th pick of round four on Saturday morning. I looked at San Francisco’s running back stack. I looked a second time. No Joe Williams. He was off the 49ers’ draft board. Yet, for the head coach, if there was one must-get player on the last day of the draft, it was the troubled Williams. Now Saturday was going to be interesting, if only to find out the fate of Williams. Can you ever say, unless you’re a scout or a GM or a coach or Mayock or Kiper, that the third day of the draft is really interesting? • Football passion—do they love it? 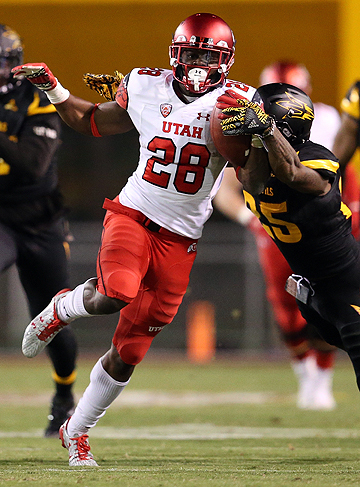 Joe Williams wasn’t on the 49ers draft board before the team traded up to select the Utah running back. The Williams thumbnail: Kicked off UConn’s team in 2013 for stealing a teammate’s credit card and using it … enrolled in a tiny Brooklyn college trying to get his football career back … enrolled at Utah in 2015 … Quit Utah’s team in September 2016, telling head coach Kyle Whittingham he couldn’t deal with the mental pressure he was going through … Returned to the team at the coaches’ request a month later when three backs got injured … After a month away from any physical activity, he ran for 179 yards against Oregon State, and then, in his second game, he set the Rose Bowl stadium record for a college running back, rushing for 332 yards and four touchdowns in a Utah win over UCLA. And they talked. Lynch was stunned by Williams’ forthright admissions. Lynch found out what he believed to be the root of the problems: In 2007, when Williams was 13, his sister died of a heart ailment, and Joe Williams felt the burden was with him, because on the night she died, he was with her and fell asleep when she fell gravely ill. He was destroyed, distraught, and ignored his pain, and as he discovered later, the bottling up of his pain caused extreme distress. He was diagnosed with manic depression. He told Whittingham he would do himself more harm than good by staying on the team, and Whittingham understood. The team understood. After a long time on the phone, Lynch had a radical change of mind. Early in the fourth round, Lynch, responding to the agita of his head coach, traded up 22 spots to pick a player not on his draft board. But how does one walk back onto the field, after doing nothing for a month, and, in successive games, gain 179, 332, 172, 181, 149, 97 and 222 yards in his last seven games? 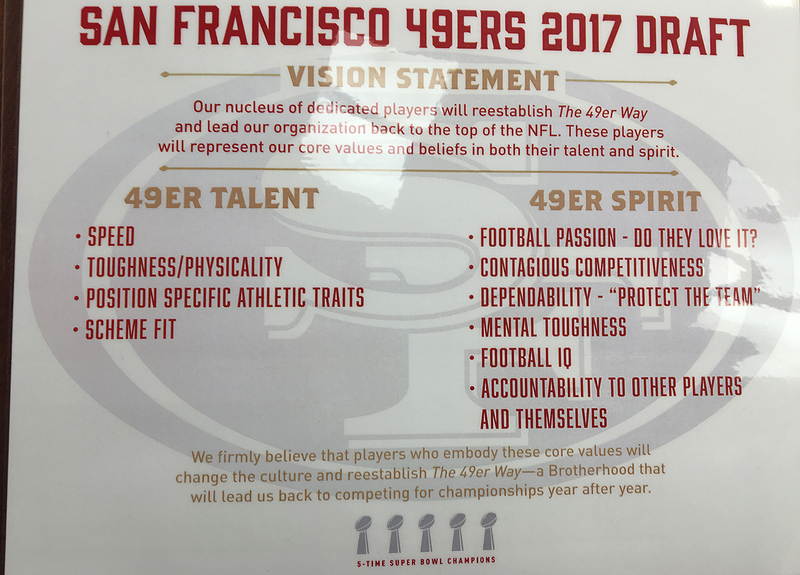 The laminated 49er ethos sheet didn’t account for Joe Williams. Lynch won’t know for years, most likely, if he made the right call on Williams or any of these players. “What do you think Bill Walsh would say about your draft?” I wondered. 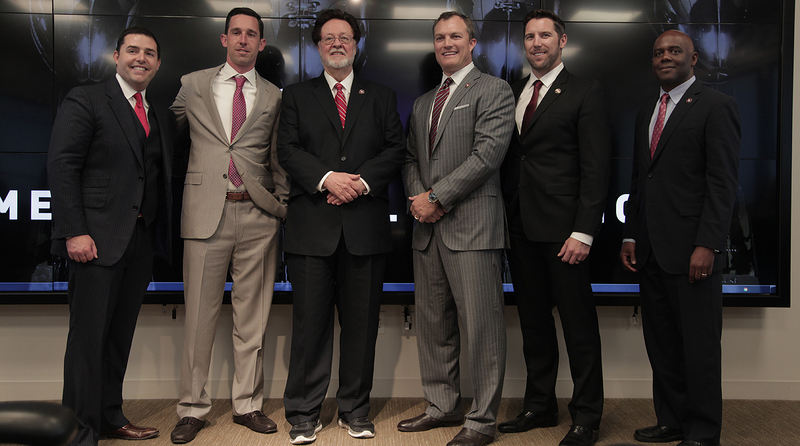 From left: Jed York, Kyle Shanahan, John York, John Lynch, Adam Peters and Martin Mayhew. The one thing I learned through this process, through my 11th time inside a team’s draft room: There isn’t one way to do this. A year ago, after watching the Cowboys’ draft, I remember a morose Jerry Jones being angry at himself for not being to pull off a trade so Dallas could pick quarterback Paxton Lynch. And then Dallas was foiled at a shot to get its next-best choice for a rookie quarterback—Connor Cook. The Cowboys settled for Dak Prescott. Draft grades are crazy. Judge Tom Brady at 199. Judge Ryan Leaf at two. In this draft, one team, the Bears, likely stood between John Lynch picking Reuben Foster at three, or picking him at 31. Maybe Reuben Foster will be Ray Lewis. But based on first-round history, there’s a 50 percent chance he’ll be a bust. The moral of this year’s draft-embedding? If Lynch drew a hard line about his 49er ethos, maybe Foster and Williams aren’t Niners today. If Jed York hired a hard-liner instead of a GM willing to open his mind about guys like Foster and Williams, the story’s different. And certainly not as good, or compelling. It’s doubtful the first draft of John Lynch will be as historic as Bill Walsh’s first one. But there is no way Walsh’s was this dramatic. The Bears traded up and used the second pick in the draft on North Carolina quarterback Mitchell Trubisky. When new Chicago quarterback Mitchell Trubisky was introduced to the crowd at the Celtics-Bulls game Friday night in Chicago, fans booed. 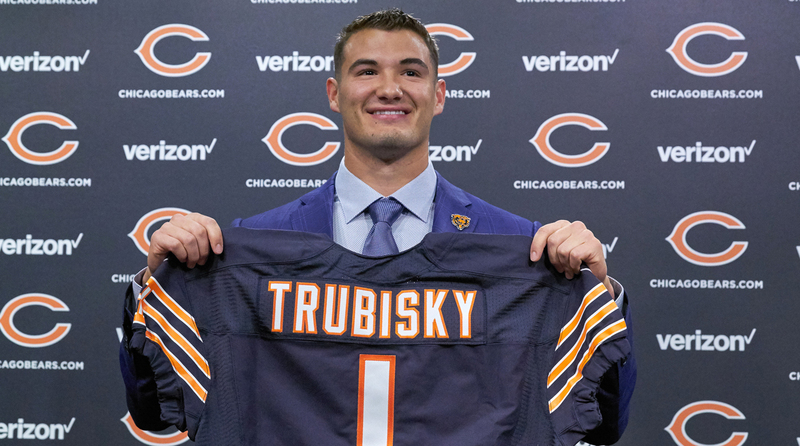 It was probably due to the impression from fans that the Bears overpaid to move up from the third pick in the draft to the second to get Trubisky in a trade with San Francisco. I disagree with the anger over the deal. The last time a team traded up from three to two in the first round to get a quarterback happened in 1998, when San Diego moved up one spot and ended up drafting Washington State quarterback Ryan Leaf. Let’s compare the compensation paid for two quarterbacks picked in the same spot 19 years apart. • What the Bears paid to move from three to two for Trubisky: third- and fourth-round picks this year, and a 2018 fourth-round pick. • What the Chargers paid to move from three to two for Leaf: a second-round pick in 1998, a first-round pick in 1999, returner/receiver Eric Metcalf and linebacker Patrick Sapp. NFL teams use a device during the draft (referenced above in my lead on the Niners) called the draft-trade value chart, which assigns points to every pick in the draft. So when teams start to talk trade, they can use some sort of universal trade language to calculate the fairness of the compensation. Let’s calculate how much San Diego GM Bobby Beathard paid to move up to get Leaf, and how much Bears GM Ryan Pace paid to move up for Trubisky, using an estimate of the 16th pick in the fourth round to calculate the value of the 2018 pick for this year’s calculus. • Points Beathard paid to get in position to draft Leaf: 1,980. • Points Pace paid to get in position to draft Trubisky: 580. I know how this looked Thursday night: The Bears waaaay overpaid for Trubisky, when they could have just sat at three and drafted him. That’s possible, and in fact it’s more likely than not. But as someone who was with San Francisco GM John Lynch for much of the day, and in a planning meeting with cap guy Paraag Marathe and coach Kyle Shanahan 25 minutes before the draft began, and in the 49ers’ draft room that evening, I can tell you that is a false assumption. Ask me my gut feeling, and it is that yes, the Bears would have gotten Trubisky at three without moving. But it was not at all certain. What if the scenario happened that, as of Thursday, was legitimately possible—what if the Browns packed up enough picks to make the Niners move from two to 12? The 49ers had been in touch with Cleveland before the draft, and were anticipating they could get a call from the Browns when they were on the clock at two with Trubisky available. There was also a mystery team that I could not identify that wanted to move to two and wouldn’t say which player the team was targeting. Understand this also: The Niners were not stuck on drafting Solomon Thomas had they stayed at two. It certainly was most likely, but they would have been fine with moving back for a ransom, or moving back as far as eight and taking Reuben Foster for less of a ransom. So let’s say you’re Pace, and you’ve determined that you really want Trubisky. You call the 49ers and trying to work out fair compensation if the Browns do not pick him at one. You think Trubisky’s going to be the long-term Bears quarterback, starting in 2018 or later. By late Thursday afternoon, you think there’s probably an 80 percent chance you’re going to get Trubisky at three. Are you willing to take the chance of staying put? Or, for the cost of the 67th and 111th picks this year and a third-rounder next year, are you willing to guarantee you’ll get Trubisky if Cleveland passes on him? The market for quarterbacks is always weird. In 2004 the Giants had the fourth overall pick and dealt it to San Diego for the first overall pick, so New York could snare Eli Manning. The Giants gave up future first-, third- and fifth-round picks to make the swap. That’s a lot. But is it really? Manning has helped deliver two Super Bowl titles to the Giants in 13 seasons, and he’s been an ironman. This year’s market was filled with flawed passers who were lusted after nonetheless. Really, the NFL has two drafts—a regular draft, and a draft for quarterbacks. Three teams moved up a total of 31 draft slots this year to get quarterbacks in the first round. The Bears, Chiefs and Texans paid a total of two 2018 first-round picks and a third- in ’18, plus two thirds and a fourth this year to move up for Trubisky, Pat Mahomes and Deshaun Watson, respectively. For quarterbacks, NFL history says you pay Four Seasons prices. That’s why I can’t fault Pace for what he did. He wasn’t willing to risk losing the guy he loved. 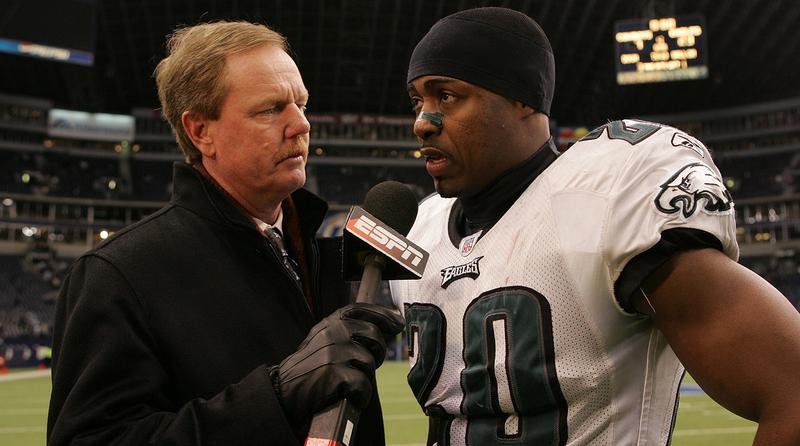 One casualty of the ESPN layoffs last week was reporter Ed Werder, who covered the NFL for the network since 1998. —Ed Werder, the outstanding NFL reporter, to me, in the wake of getting laid off by ESPN while on assignment (an assignment he did not complete) in New Orleans covering the draft. He was one of an estimated 100 ESPN employees who got the ax not because of performance but because of economics, a seismic shift in the sports journalism community from the most solid rock of sports media. That quote will be part of my piece on the painful week of Werder, which you’ll read Tuesday at The MMQB. —Oakland GM Reggie McKenzie, to me, when, after discussing the controversial first-round pick of Gareon Conley by the Raiders, I asked about the trade for the formerly retired running back and Oakland native, Marshawn Lynch. —Giants GM Jerry Reese, asked about second-round pick Dalvin Tomlinson from Alabama. Tomlinson is seeking a degree in financial planning. —Former Dallas wide receiver Drew Pearson, who drove the crowd crazy in Philadelphia with a massive trolling of the Eagles while introducing the second-round pick for Dallas. —James Palmer, NFL Network reporter, in a network draft preview Thursday. —Rich Eisen of NFL Network, Friday, on the truly amazing scene that was the NFL draft in Philadelphia, with the brunt of the estimated 100,000 doing the “E-A-G-L-E-S EAGLES! !” chant. —Philadelphia VP of player personnel Joe Douglas, on 5'9", 180-pound running back Donnel Pumphrey of San Diego, drafted 132nd overall by the Eagles. 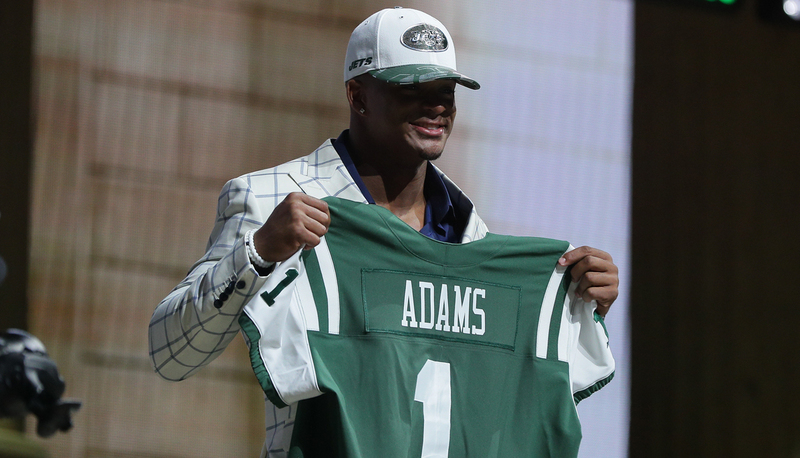 The Jets were surprised to see Jamal Adams still available at No. 6. The LSU product was widely considered the best safety in the draft. Forrest Lamp (second round, 38th overall) and Dan Feeney (third round, 71st overall), guards, L.A. Chargers. GM Tom Telesco knew he had a major weakness in his offensive line, and I’ll be surprised if both of these men are not starting by midseason. Jamal Adams (first round, sixth overall) and Marcus Maye (second round, 39th overall), safeties, New York Jets. When head coach Todd Bowles was Arizona’s defensive coordinator in 2014, his linebacker corps got decimated by injuries and suspensions, and he experimented with putting a couple of his physical safeties in the box at linebacker. It worked well—very well, in fact, and Bowles kept doing the versatile game-planning even when he had a full complement of linebackers. Adams weighs about 214, Maye about 212, and you can be sure Bowles will help his linebackers with the use of these guys on certain downs. They’re both very good tacklers. The hybrid way is how the Jets will play in 2017. Ryan Switzer (fourth round, 133rd overall), wide receiver/returner/special-teamer, Dallas. Seven career punt returns for touchdown at North Carolina, and a ruthless and instinctive competitor. Watch some Steve Tasker tape, Ryan. That’s your best NFL model. John Lynch, San Francisco. Running his first draft room, piloting a front office for the first time, Lynch did more than he hoped he’d be able to do—and that would have been the case considering the first round only. He got the second guy on his board (Solomon Thomas) with the third overall pick, engineering a good trade for the Niners in the process, and drafted the third guy on his board (Reuben Foster) with the 31st pick, nudging out the Saints at 32 in the process. Brandin Cooks from New Orleans to New England for the 32nd overall pick. Cooks is 23, has averaged 72 catches a year in his first three NFL seasons, plays tougher than he looks, and will play for the next two years for a total of $10 million. What’s not to like? And if you’re the Saints, you feel you’ve gotten in Ryan Ramczyk a guy who’s likely going to be a starting tackle for you soon—maybe this year—and it’s unlikely they’d have signed Cooks long-term after 2018. So from each team’s perspective, it’s a good deal. Sitting with Kyle Shanahan a few times over the weekend, I learned a few things. Mostly this: The world’s not the same as it used to be, and there’s nothing wrong with that. 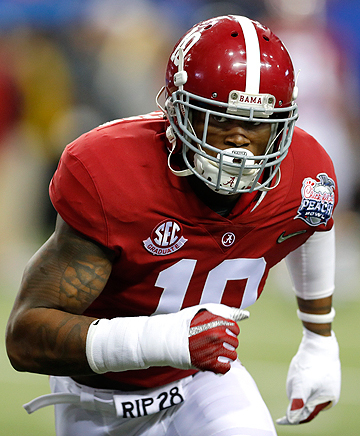 We talked about the Niners’ late-first-round pick Reuben Foster late Thursday night. Foster was a pretty big red-flag guy entering the draft, with the confrontation at the combine that got him sent home, the shoulder that might require more surgery, the diluted positive drug test, the weird Alabama-then-Auburn-then-back-to-Alabama recruiting process in high school that resulted in him getting death threats. 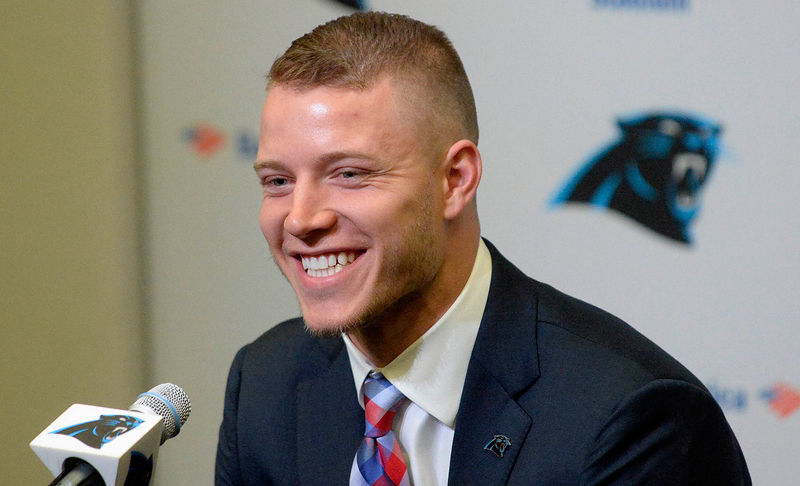 The Panthers picked Christian McCaffrey eighth overall in the hopes he’ll help the offense become more versatile. Nineteen passes attempted to James White and Dion Lewis. Fifteen completed. “So maybe sometimes it turns into just a four-yard gain. But I’ll take a four-yard gain,” Shula said. In the draft, the Panthers did a couple of things to help Cam Newton, who completed just 44 passes to his backs last year while crashing to a 52.9 percent accuracy rate, a stunning 7 points lower than 2015. Carolina drafted Stanford’s Christian McCaffrey and Ohio State’s Curtis Samuel, a couple of versatile backs/slots/receivers with 206 career receptions and 804 career rushes in college. McCaffrey will play running back, slot receiver and wideout (less) and help in the return game. Samuel could become the next Percy Harvin, with jet sweeps and pitches and some field-stretching on the outside. They are potentially going to overhaul how Shula calls his offense, and give Newton some easy completions. “They’re glorified runs sometimes, but they work and it doesn’t matter what you call them,” Shula said. I spoke with Shula after the McCaffrey choice Thursday night and before Samuel was picked in round two. The Samuel pick was an exclamation point on my theory to Shula. Two picks in the top 40, to resuscitate Cam Newton. That’s how I see it. Not 19 targets to his backs per game, certainly, but five or six easy completions in an offense that has been predominantly deep strike. It’ll be interesting, too, to see how the Panthers’ return game (2016: 7.0 yards per punt returns, 22.4 yards per kick returns, both mediocre) is impacted. The early guess is McCaffrey could handle punts and Samuel kickoffs. It’s hard not to like what the Panthers did for their offense, and to make their quarterback more efficient, in this draft. When former Pitt running back James Conner reports to his new team, the Steelers, he’ll have a short trip. It is 15 steps from the front door of the Pitt football facility to the front door of the Steelers facility. They are connected on Pittsburgh’s South Side. There were trades involving 11 slots in a 13-pick span in the low-first, high-second round area, and I’m convinced that has to be a record. Some of that was due to the fact that teams can now trade compensatory picks; 20 of those picks were involved in trades. But I think overall the record number of trades (38) happened because teams have a cadre of young draft/cap managers (I saw it in Paraag Marathe in San Francisco) who flip picks so fast and figure the real value of picks quickly and efficiently—and most teams have trade managers who are similarly versed in the well-worn NFL draft-trade value chart. In April, Eric Thames of the Brewers had more home runs against the Reds (eight) than Giancarlo Stanton or Nelson Cruz or Anthony Rizzo or Yoenis Cespedes had home runs. 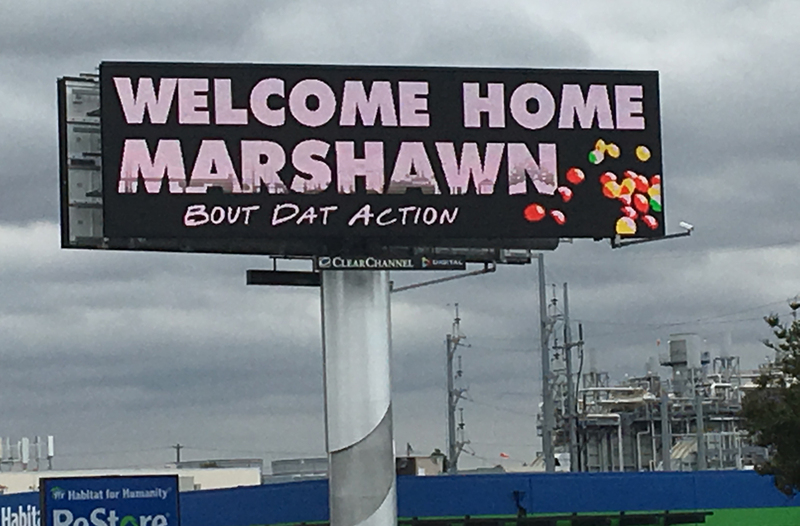 A Beast Mode billboard popped up in the Bay Area to welcome back the Oakland native. News of the Marshawn Lynch trade from Seattle to Oakland broke around 4 a.m. Pacific Time. As I drove away from the San Jose airport Wednesday afternoon at 1:54 p.m. PT, I had to pull over to the side of US 101 North to take a picture when I saw this billboard. What a world. Less than 10 hours after the deal gets done and is out in the public eye, the locals see a welcome-home billboard. What is the purpose of grading a draft class hours after that draft is over??? How in demand has NFL draft become? 16 cities have sent representatives to site survey Philly with hope that they can host future drafts. First 3 rounds are for the decision makers. Rounds 4 thru 7 is all about the scouts! The Washington cornerback stayed in Philadelphia after going undrafted Thursday night. King got his draft thrill early Friday, being picked first in the second round by Green Bay. If I have to hear Fly Eagles Fly again, I'm gonna vomit! The Eagles’ theme song got quite a major three-day run at the draft. I hope @88DrewPearson gets some endorsement $$ for yesterday's performance. Will help make up for $150 bonus I gave him as an UDFA in 1973. This week: Mike Mayock on all things draft. • Mayock, a college safety at Boston College, on his draft day—April 29, 1981, when he was chosen in the 10th round, by the Steelers, 265th overall, just 257 picks after a slightly more famous defensive back in the draft, Ronnie Lott: "I was the captain of the Boston College baseball team, and we had games on both days. And back in those days the draft was Tuesday and Wednesday, carried by ESPN, and it was six rounds each day. We played a home game on Tuesday, and I was hoping to go on Tuesday. I remember being out there, I played first base and centerfield, and I think I was first base that day. I want to say we were playing UConn but I'm not sure. This was way before cell phones, and my roommates were waiting in the room to see if I got picked. And if I got picked, they were going to sprint down to the field screaming and yelling. And I kept looking toward the hillside apartments, hoping to see my roommates. And no roommates! So I got several phone calls that night saying, ‘Hey we might pick you tomorrow morning, be ready.’ And so I had an away game Wednesday at Harvard, and we had to leave on the bus at a certain time, and I called the coach and asked him if I could drive myself to the game as long as I got there by a certain time, just so I could hang in there in case I got the phone call. So I am sitting there in my baseball uniform waiting until the last minute to drive this borrowed car I have to Harvard. I'm waiting and I'm waiting and they are in the 10th round and I'm just so upset. I can't even tell you how upset I was. I thought I was going to get drafted higher, and I hadn’t been drafted at all. They're in the 10th round and I have to leave for Harvard. I'm already pushing it to get there, and I'm at the elevator in the fifth floor of our building, and I hear this, ‘Mike, Mike, Mike, you got picked by the Steelers, oh my God!’ And I'm like, ‘That ain't funny. You guys aren't right. That's BS!’ I'm screaming at my roommates because I think they are messing with me, and they weren't. So I go back in and sure enough it is the Pittsburgh Steelers on the phone. 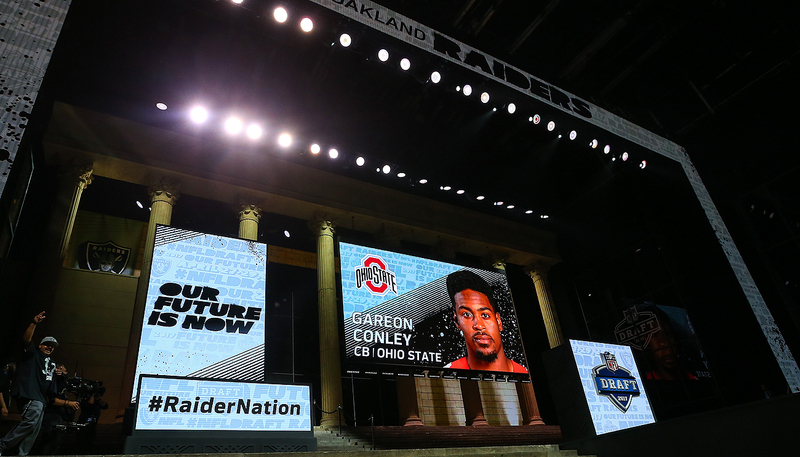 The Raiders used their first-round pick on Gareon Conley, who was the subject of an unresolved sexual assault allegation in the days leading up to the draft. a. The Raiders better be right on Gareon Conley. b. I dare say Chad Kelly is probably the most talented Mr. Irrelevant of all time. c. Football is a funny game: A long-snapper, Colin Holba, was drafted in the sixth round by Pittsburgh, ahead of quarterbacks Brad Kaaya and Chad Kelly—ahead of 40 other players, actually. d. In the second half of the first round, the pass-rusher’s name I heard the most while researching my mock draft was Charles Harris. Miami made a good call at 22, and the Dolphins are fortunate to get him there. e. Thought the Bengals did really well, but I will echo what one coach told me about Joe Mixon: You better have a plan for him in place the minute he walks into the building—and it better be a plan not just for one year but for each year he plays for you. g. The Panthers are going to be great fun to watch. h. Favorite draft celebrity picker: The team of two (of eight) Philip Rivers children, announcing safety Rayshawn Jenkins in the fourth round in Carson, Calif., the new temp home of the Chargers. i. Favorite scene: The Cardinals’ pick from the Grand Canyon, a really touching moment, with running back David Johnson with the wife and son of slain Arizona police officer and Cardinals fan David Glasser. j. Did okay, not great, on the mock draft: six direct hits (Myles Garrett, Solomon Thomas, Leonard Fournette, Christian McCaffrey, Pat Mahomes, Deshaun Watson) and 29 of my 32 first-round players were drafted somewhere in the first round (missed on Adoree Jackson, Evan Engram, Taco Charlton). 2. I think it’s easy to take potshots at owners for making changes, and now Terry and Kim Pegula, who bought the Bills 30 months ago, will be hiring the second GM of their tenure to go along with three head coaches in that short time. The fired Doug Whaley, history will show, likely overspent trading up for first-round wideout Sammy Watkins in 2014, and picked wrong with quarterback E.J. Manuel in the first round in 2013. So no one’s saying Whaley got jobbed. But I’ll keep coming back to the point I make about franchises that make changes regularly: Show me one with nine coaches in 17 years, a succession of would-be franchise architects, and no steady, winning quarterback, and I’ll show you a team that never wins. So I understand dumping Whaley. But nothing is going to change in Buffalo without two things: continuity, and a quarterback the franchise commits to. 3. I think I must ask (and I am not the first): Is it really necessary for Roger Goodell to announce all the picks on day one, and a host of them on day two, while boos rain down on him like a summer storm in a rainforest? I bring you two sub-quotes of the week, from day two, when you think the crowd might have gotten the booing out of its system after doing it 32 times on Thursday. The first, when Goodell went onstage with Ron Jaworski to kick off day two, and he could barely be heard over the booing in Philadelphia: “JUST ONE SECOND! And you can resume your booing.” And then this, every time he returned Friday: “BOOOOOOOOOOOOOOOOOOOOOOOOOOOOOOOOOOO!” Wouldn’t it be better, say, if he kicked off the draft with either military folks with him (perhaps just after the national anthem) or with some legendary players on stage from the city hosting the draft? And then, in each city, a local legend (Ron Jaworski in Philadelphia, for example) announces the first-round picks, with Goodell off to the side, welcoming and bro-hugging the players but not getting showered with disdain … and then the league continues the tradition of various announcers for the rest of the draft. It’s getting distracting, trying to hear Goodell over the rancor. It’s almost to the point that the booers seem to be trying to out-do themselves. It can’t be good for the league, or the 32 owners, to see that, year after year. 4. I think the league, despite its protestations to the contrary, has to get serious about allowing the use of marijuana for pain management. Because it’s going to be used anyway. 5. I think the most stunning non-draft news of the week, to me, was the Vikings prepping to say goodbye to Teddy Bridgewater after the 2017 season, reportedly leaning toward not exercising his fifth-year option. Just think where we were nine months ago. Bridgewater was the centerpiece of the franchise, the 10-year cornerstone. Then, just before the season started, he took one awkward step on the practice field and blew out his knee and did significant damage, and there reportedly hasn’t been enough recuperation, and here we are. Amazing and sad at the same time. 7. I think a really smart story in the run-up to the draft was this one by Conor Orr of NFL Media, about the cloak-and-dagger business of finding out real information when scouts are on college campuses. Orr got scouts past and present to reveal some secrets about how they get information. And this about why college programs are so cryptic with the NFL. “Recruiting,” former Bears director of college scouting Greg Gabriel told Orr. “In today's world, they gotta try and protect their players. If word gets out that they're saying negative things about their players—and trust me, a lot of them do—they have to be discreet about it. And that goes back to relationships. You have to have the right relationships.” Worth your time. 8. I think Philadelphia performed like it should host the 2018 draft too. The NFL has an option for second year in Philly, and will strongly consider it after the city’s outstanding performance. But I also think Dallas is still the favorite to host in 2018. Sentimentally, I’d love to see Canton get the 2020 draft, on the 100th anniversary of the birth year of the league. The Pro Football Hall of Fame city is in the running, but I don’t sense it’s in the driver’s seat. 1967: Bo, Bob, Jim, Bob, Leo, Tom, Willie, Lem, Don, Bob, Rich, Spain, Tom, Ron, Dave, Jim, Bob, John, Rick, Larry, Jim, Bob, Roy, Willie, Jim, John, Dave. 2017: Kevin, Cam, Malik, Budda, Zay, Forrest, Marcus, Curtis, Dalvin, Marcus, Sidney, Gerald, Adam, Quincy, Tyus, Joe, Ryan, Justin, Demarcus, DeShone, Teez, Raekwon, Dalvin, Obi, Zach, Ethan, Tanoh, Chidobe, Josh, Juju, Dion, Taylor. In 1967, number of Bob/Jim/Tom/Johns: 13 (48.1 percent of the round). In 2017, number of Bob/Jim/Tom/Johns: 0 (0.0 percent of the round). There were five Zay/Dalvin/Teez/Tanohs in 2017, zero in 1967.
a. Column of the Week, by Paola Boivin, who is leaving the Arizona Republic to teach full-time at Arizona State. b. Journalism is a noble profession, and don’t let anyone convince you otherwise. No matter how big a job that certain someone has on this planet. c. I’m so glad that when the name “LaVar Ball” surfaces in some story or in some headline, I immediately move to the next story. It’s a point of pride, really. d. Judging from the headlines, though, LaVar Ball does seem to be on a cold streak. e. I was a paying a little bit of attention to the NBA when the Celts went down 2-0 at home to the Bulls, and not much after that because of the nuttiness of the draft for a week or so. And I look up Sunday and there they are, beating Washington in the first game of the next series. Boston picked a nice time to go on a five-game winning streak. f. Of course, the 11th-place Montclair Pedroias did not draft Anthony (10 RBI) Rendon in their fantasy draft in March. Or, for that matter, any other players worth a crap. g. Coffeenerdness: illy espesso, at the Detroit Metro Airport, is a must-stop when I’m going through. It’s a simpler menu with excellent espresso. h. Beernerdness: It is a national sensation, Allagash White (Allagash Brewing, Portland, Maine). How do I know? After the first day of the draft, in a restaurant/club area of Levi’s Stadium, I was shocked to see it on the menu, and of course I took advantage of this little lost beer 3,000 miles from home.